I love Trisha Ashley's books. "The Urge to Jump" remains one of my all-time favourites. 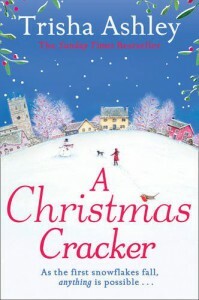 So I really wanted to love "A Christmas Cracker" (even if I didn't like the title - it references the Christmas cracker making business in the novel). It had all the hallmarks of many of her enjoyable books. One of which was "The Twelve Days of Christmas" and you'll see characters from that book in this one, but more or less peripherally. There is the rat of an ex-boyfriend, a glowering potential hero (the chapters from his perspective really failed for me), energetic elderly people, and a pet cat. I wonder if it was me, but this time, the quirkiness seemed forced, and so, failed to charm. I thoroughly recommend Trisha Ashley's books, but don't start with this one!